KOORONG MUSIC MANAGER'S VIEW 2006: With a Masters degree in jazz performance and backed by the Cool Springs Quartet, the chief musician on this album is Juju Song. 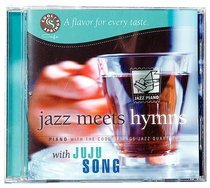 This CD is great value and well worth a listen, with excellent renditions of classis like 'It Is Well With My Soul', 'Nothing But The Blood' And 'What A Friend We Have In Jesus'. If You Like: Jazz Music, James Morrison, Idea of North. 6 - Were You There?